Eswatini made it two wins from two in the Boys Under-17 competition at the 2018 AUSC Region 5 Games in Botswana when they defeated Zambia 1-0 in their Group A clash on Sunday. Eswatini secured a semifinal place with the victory and look the team to beat having taken maximum points from their first two fixtures. Nhlanhla Makwakwa scored the only goal of the game, but Eswatini always looked comfortable and were deserving of the victory. Hosts Botswana moved into second place with a 1-0 victory over Namibia, who are now eliminated from the competition after a second defeat. Oageng Maphorisa netted for Botswana in what was a clinical display that kept them on course for the semifinals. They will need just a point in their final game against Eswatini to make sure of progression. Group B is on a knife-edge with all four asides on three points after two matches. A goal from Boitumelo Radiopane secured a 1-0 success for South Africa over Angola that brings them back into semifinal contention after a surprise loss to Malawi in their opener. Tanzania boosted their chances with a 2-1 victory over Malawi after goals from Kelvin Pius and Ladaki Juma. Malawi hit back through Patrick Mwaungulu but it was not enough to get anything from the game. 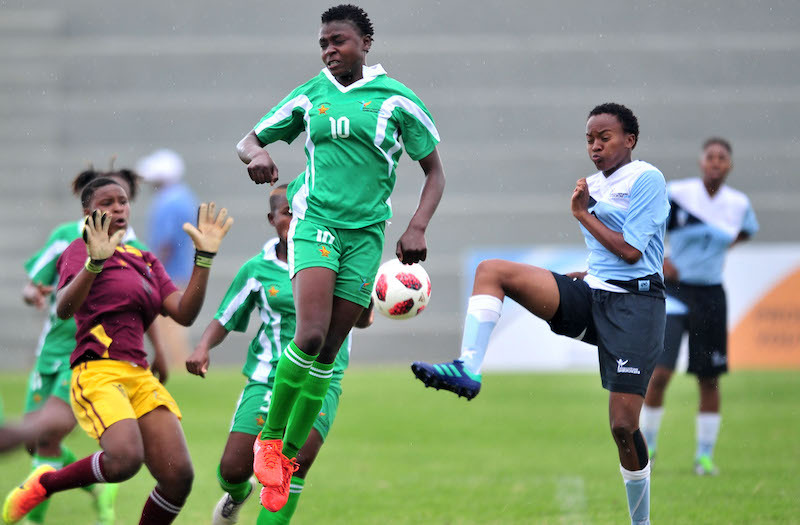 South Africa sealed their place in the semifinals of the Women’s Unxder-20 competition after a 2-0 victory over Namibia in a game that was carried over from Saturday when torrential rain forced a suspension with 28 minutes played. It is a result that also ensures Namibia’s passage in the three-team group, with the battle for top spot to be played out on Monday when the two teams clash. A pair of defeats for Eswatini means they cannot advance. South Africa scored a stunning opener through Sibulele Holweni that involved some stunning build-up play and an excellent finish. The points were made safe 10 minutes from time when Kirsten Nolan added a second. Meanwhile in Group A, Botswana leapt to the top of the pool with a 3-1 victory over Zimbabwe. Goals from Keitumetse Dithebe, Lesego Radiakanyo, Esalenna Galekhuthe put the home side in charge, before Natalie Moruve pulled one back late on for the Zimbabweans. The next fixture in the pool will be played on Monday when Malawi take on Lesotho. The Malawians drew their opener with Botswana, while Lesotho were well beaten by Zimbabwe.